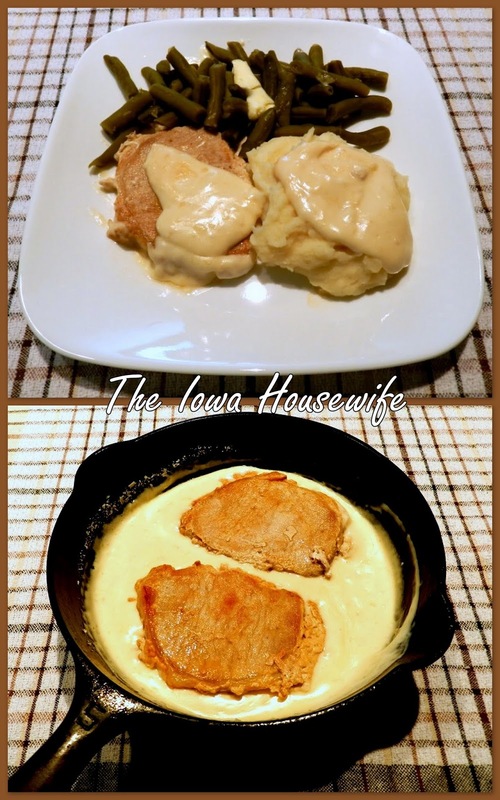 Here’s a recipe folks from Iowa will like…delicious pork chops in a seasoned cream gravy. Our guests said “What are you making for lunch? It smells wonderful!” when I served this. One change I made was using 6 chops instead of 4 for the same amount of sauce, as we thought that was plenty per person. I didn't use the flour the second time, the cream thickens up just fine without it and then the recipe is gluten-free too. If you have very much juice in the pan you may want to use it. The recipe is adapted from therecipecritic.com, a blog that has a wide following. We enjoyed it with mashed potatoes and home-canned green beans. Heat a large skillet over medium heat. Add butter and allow to melt, stirring to coat the pan. Sprinkle each pork chop with salt and pepper to taste on both sides. Add pork to skillet and cook each side for 4-5 minutes or until both sides are golden brown. Turn off heat and cover with a tight lid. Let the chops sit for 8-10 minutes until fully cooked through. Set aside on a foil tented plate to keep warm. Scrape the fond off the pan and leave it with the juices, no need to clean the pan. Heat pan to medium high heat. Toss garlic in the pan and allow to caramelize for 1-2 minutes until fragrant. Add in the flour and cream and stir quickly to combine. Bring to a boil, and then reduce to a simmer. Allow to simmer for 2 minutes. Stir in the grated parmesan and fresh parsley, stirring until fully combined and heated through. Return pork to the sauce and serve. I bet they loved it. Your meal looks perfect for any season, but especially for our current cold weather! Do you think there's any reason one couldn't use a bone-in chop? Imagine it might increase the cookig time. Not Sue, but bone in pork chops are what I buy. I think they are more tender and I wouldn't add any cooking time. I'll ask Sue tomorrow what she thinks. This was so good - and came together easily. I'll definitely make it again! Thank you! That's exactly what we thought! Glad you tried the recipe.